Kealoha is Hawai‘i's first and only (so far) Poet Laureate. He was so named by Governor Neal Abercrombie seven years ago, when he delivered a moving poem at the Governor's Inauguration. 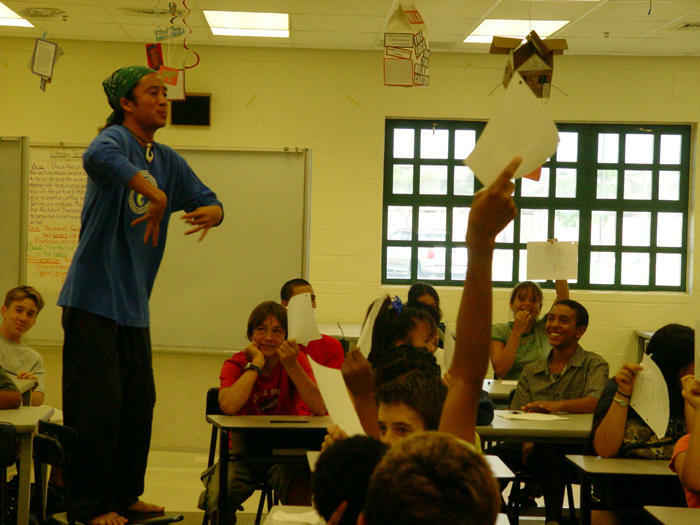 Active in school and workshops education programs, Kealoha is also a founder of First Thursdays, an ongoing slam poetry competition where people from all walks of life lift a corner on some of their deepest thoughts. Hawaiian Brian's turns out to be a conducive venue for First Thursdays. There's a live artist drawing onstage to the left and a DJ bridges segments at the back. Front and center, are the poets themselves, a true study in human psychology as they approach the mic and begin to weave their three minutes of storytelling. Hawai‘i Slam, a monthly spoken word poetry competition, has been happening since 2003. 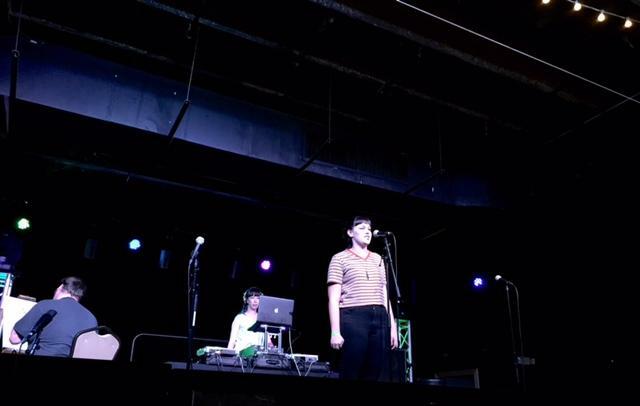 It’s considered the largest poetry slam in the world, attracting 500 plus people at its peak This year, Hawai‘i's team placed second in the National Poetry Slam competition. You'll find enthusiastic crowds regularly at the First Thursday slams at Hawaiian Brian’s, and Noe Tanigawa reports you may be surprised by what you hear. A brief look at what Hawai'i's Poet Laureate has been up to and how the slam poetry scene is doing in Hawai'i. First Thursday poetry slams continue at Hawaiian Brian’s on Kapi‘olani, with a hundred dollar purse for the evening’s winner. This Thursday, elimination rounds continue toward the National Poetry Slam in August, 2017. After noting remarkable growth in material and delivery at a recent First Thursday, I met up with the poet, Kealoha, who runs the slams, in Kaimukī . He’s had quite a ride for an MIT physics guy turned poet. Are you still Poet Laureate of Hawai‘i? did that have a term limit or anything? Kealoha’s latest project, “The Story of Everything,” has kept him pretty busy the last four years. Pulling from his science background, Kealoha conjures the Big Bang, follows planetary then terrestrial evolution to humans, then traces human development from Africa on out. Performers at First Thursdays vie for a $100 purse, and the top two finishers go on to the semi-finals in April, when Hawaii's representatives at the National Slam Competition are chosen. Kealoha says humans today need to straddle digital and physical worlds. That’s Travis T, slam poet, educator, co-founder of YouthSpeaks, an ongoing program for young slam poets at Marks Garage. 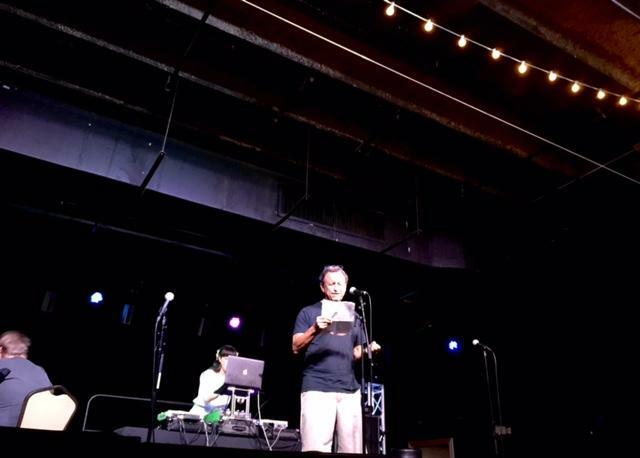 At First Thursdays, Kealoha says he usually knows a half dozen poets well, maybe another six are familiar, and another handful will be a complete surprise. Bear here, just jumped in and found himself swimming. Never expected to hear that. At the last National Poetry Slam, Hawai'i's team placed second in the nation! Elimination rounds for this year's contestants are ongoing until the semi-finals in April, when the team is chosen. Through the summer, No Rules Slams take place on First Thursdays. Contestants are welcome to perform in any medium; expect surprises. If you have a young poet in your family, connect them with Pacific Tongues, a youth poetry workshops series that runs out of Marks Garage. William S. Merwin was United States Poet Laureate in 2010, and he’s received numerous awards including two Pulitzers for his work as a poet, translator and environmental activist. 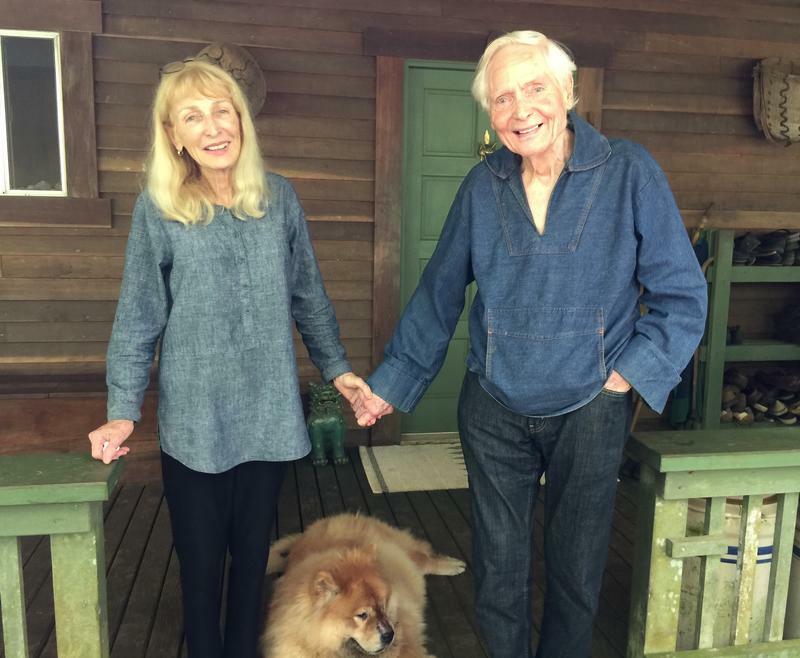 Over the last 30 years, Merwin and his wife, Paula have been developing an internationally recognized palm garden on Maui. HPR’s Noe Tanigawa offers a look at the relationship he has with that place. Take a video walk through the Merwin Conservancy palm forest with W.S. Merwin. Hawai‘i has a strong clay culture, and much of it is community based. The Hawai‘i Potters’ Guild, the Volcano Village Artists, Hui No‘eau, the Lāna‘i Arts Center, and Kaua‘i Community College all play crucial roles keeping ceramics alive on their respective islands. Recently, the Moloka‘i Arts Center jumped in too, for people love to work with clay. 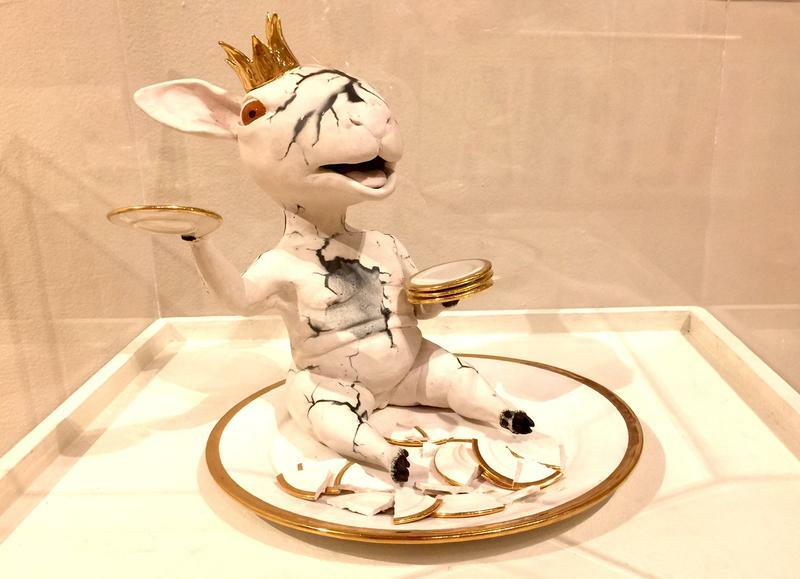 HPR’s Noe Tanigawa reports on the first statewide juried ceramics exhibition. In the mid-20th century, jazz, abstract expressionism, open form poetry, were some of the art forms that celebrated a kind of escape from regimentation and expectation. 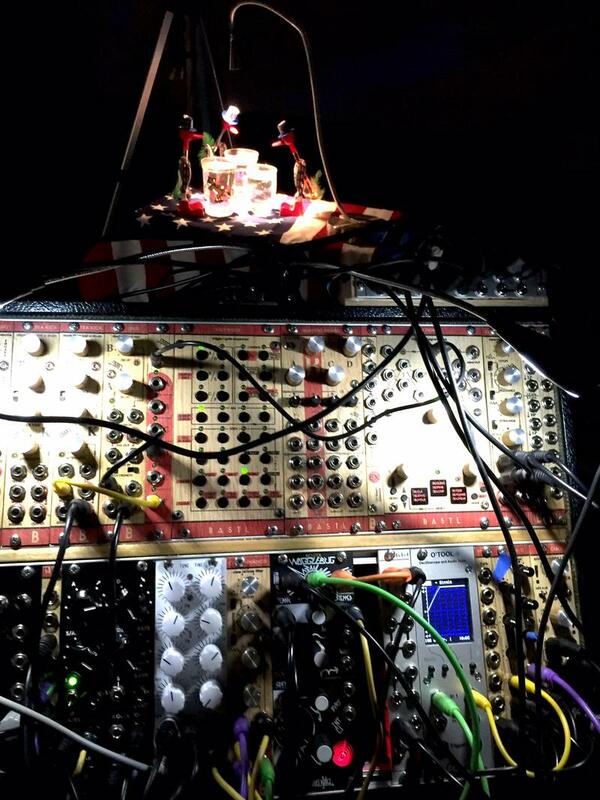 An interest in process arose, and for some, the journey became more important than the destination. HPR’s Noe Tanigawa reports a revival of that spirit is underway, for example, in an exhibition at UH Mānoa. This Wednesday around 2pm, skateboarders take on Peter Chamberlain’s interactive room. Friday 2 to 4pm everyone’s invited to participate in the closing non-extravaganza. Plastic Fantastic? Or Plastic Free Futures? This is the last weekend to enjoy a particularly splash making exhibit at Spalding House in Makiki. 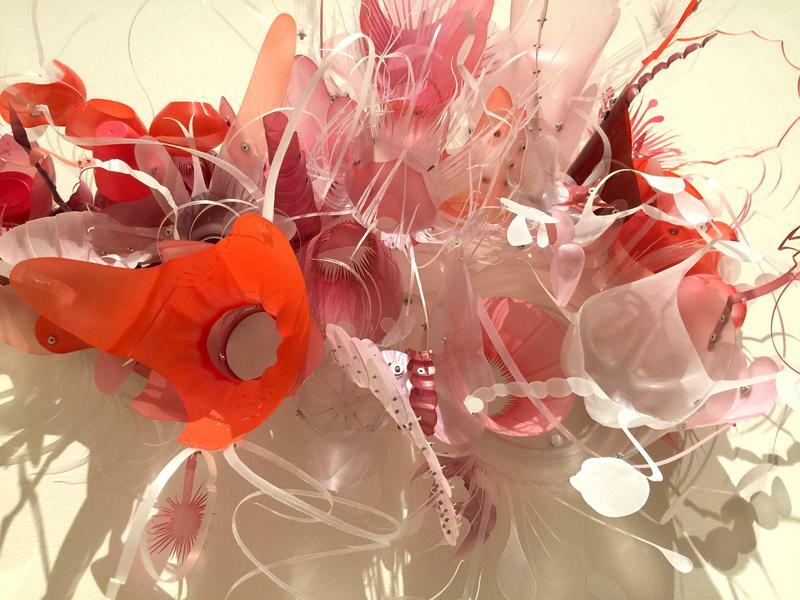 “Plastic Fantastic?” features beautiful art made of or about plastic debris. In addition, HPR’s Noe Tanigawa reports there’s progress on ways to deal with this ubiquitous, non-disposable substance. “Plastic Fantastic?” continues at the Honolulu Museum of Art’s Spalding House in Makiki through Sunday.